The little engine that could won 11 Tony Awards that included Best Musical, Best Book, Best Leading and Featured Actor and Best Leading Actress! In June 2018 Sasson Gabay, the Israeli film star who created the role of Tewfiq in the movie that inspired the musical, took over for Tony Shalhoub. And on 2/04/19 a closing date of 4/07/19 was announced. After collecting a fistful of justly deserved, prestigious awards, this lovely show is enjoying a new life at Broadway's Ethel Barrymore theater. Having seen this little gem of a musical at the Atlantic Theater last winter, I was almost hesitant to revisit it on Broadway, fearful that it would feel lost on a Broadway-sized staged, or had been puffed up to better fit its new home. But hurrah, hurrah! While I feel lucky to have first experienced it in a more intimate setting, I'm happy to report that The Band's Visit on Broadway is still a charmer. The Egyptian police band is once again stranded in the nondescript Israeli town instead of their similarly named destination to funny, touching and greatly enjoyable effect. Since the only changes other than the new venue are two cast changes and a few additions to David Yazbek's terrific score, what follows is a repeat of my original review , with some changes and additions based on my viewing it again at the Barrymore. 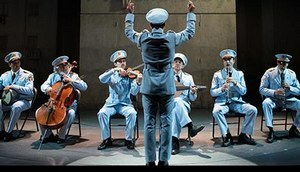 The Band's Visit is that rare screen to stage adaptation that has remained true to the plot and tone of its source but is nevertheless totally fresh and different. And though the story is delicate quiet and there are no big, razzle-dazzle production numbers, its themes are big, the staging quite dazzling and the music memorable enough to make you want to hear it again and again. (Etai Benson now plays Papi the lovelorn Israeli and Adam Kantor the "Telephone Guy," waiting by a payphone for "a very important call"). A lot of people line up at the end of stage for a splendid musical finale and well-deserved curtain calls for all. (17 as included in the program as performers, plus musicians). David Yazbek's marvelously moody score perfectly fits book writer Itamar Moses's version of Israeli writer-director Eran Kolirin's film script. The fit is so smooth that anyone who saw Kolirin's award winning debut film will wonder why it wasn't done with music as well as dialogue to begin with. The stage script follows the film's plot, and even the dialogue, quite closely. It begins with the Alexandria Ceremonial Police Band landing in Israel and buying tickets to take them to their destination at the airport bus station. The trouble is that the tickets they buy are for the town of Bet Hatikva, a cultural wasteland in the desert — not the culture rich town named Peta Tikvah where they're to play a concert at the initiation ceremony of the Arab Culture Center the next day. The night's events are a chance for loneliness and regrets to be shared and to connect a group of very different people as ordinary human beings. The way feelings surface doesn't add up to much of a plot, but it brings something special to the night the Egyptian musicians and their Israeli hosts spend together. Though characters from both sides of the cultural divide are changed, the changes, like the play, are subtly low key and probably temporary. The band's landing in the wrong town is established before a word is spoken. That's when the the band members lined up in their sky blue blue uniforms line up opposite a seedy cafe. The musicians and their leader look like escapees from an old Victor Herbert operetta. Sarah Leux has also created character defining outfits for the rest of the cast. The band member guilty for the mix-up is the flirtatious Haled (Ariel Stachel). We see him initiating his favorite pick-up routine about Chet Baker and "My Favorite Valentine with the bus ticket selling girl. But the martinet band leader, Colonel Zakaria Tewfiq (Tony Shalhoub), sternly reminds him that he's there to purchase the band's tickets. Haled's confusion about the similarly named towns sets what's essentially a cosmic joke in motion. The action shifts to the Bet Hatikva cafe and the show's first song. It's aptly called "Waiting" which sums up the locals' lethargy and boredom ("Waiting for something/For anything to happen"). This not being a film, there's no camera to take us to the various location where the story unfolds. But Scott Pask's turntable set cleverly lets the action move all around the town. The scene shifts take us from Dina's apartment, to her sort of date with Tewfiq in a restaurant. . . . to a dinner Izik (the always endearing John Cariani) and his wife Julia during which marital crisis surfaces along with a couple of lovely musical interludes by Izik, Haled and the widowed Papi (Etai Benson, a well chosen cast replacement) . . . to a booth with a pay telephone at which a young man named only "Telephone Guy" compulsively waits for a call from his girl friend (now played by Adam Kantor who gets his characters forlorn intense persona just right and also sings . . .to sings well). The trips around town even include a lively skating rink dating vignette. The non-rotating area of Scott Pask's set also has a place for some of the musicians to be on hand to deliver the enjoyable instrumental numbers. Further visual enrichment is provided by Tyler Micoleau's lighting and Maya Cirrocchi's projections. The characters we get to know most fully and memorably are Dina and Tewfiq. Both are superbly portrayed by Katrina Link and Tony Shalhoub — unsurprisingly so for Shalhoub who's a seasoned stage, film and TV actor. However, Lenk is also magnificent. One of the few good things about another unique and unusual work, Indecent which also transferred from downtown to up town not playing much longer than it should have that it allowed Ms. Lenk to play Dina, a role that's made to order for her. Lenk's Dina captures the pain of a still beautiful woman whose dreams for true love and a fulfilling life have gone unrealized. Her acting and singing merge impeccably as she tells Tewfiq about how her family loved watching Omar Shariff movies on TV and segues into the stunning "Omar Sharif." She shares another musical highlight, "Something Different," with Twezig and thrillingly reprises it as a solo later on. Shalub allows his uptight Colonel to unpack some of his own emotional baggage. Though he's usually a character actor, Shalub bravely joins Ms. Lenk in that initial "Something Different" duet. To add a bravo overlooked when I Reviewed The Ban's Visit a year ago: The linguistic awkwardness of some of the dialogue, especially Shalub's, no doubt owes much to the dialect coaching of Mouna R'Miki& Zohar Throsh-Polk. As already mentioned, nothing much happens or changes by the time the Band is ready to head for their intended destination. As Dina sums it up: "Once, not long ago, a group of musicians came to Israel, from Egypt. You probably didn't hear about it. It wasn't very important." But, important or not, you'll be glad that those musicians got that P an B mixed up. Without trying to be foot-tapping, sing-in-the-shower ear candy Yazbek's score is nevertheless addictively haunting. The original production saved the rousing finale by the band as a surprise follow-up to the cast's curtain call. It now precedes that finale (see the song list below). It may not be quite as surprising, but the real surprise of The Band's Visit is how good it is. Don't miss it.